"Hey, the International Space Station (ISS) is making a pass over the site from the north!" Well, I could see this bright object approaching and since the polar alignment was pretty much done, decided to slew the mount around and see if I could capture the light in the camera. Now, I don't know about you, but I still find operating and slewing a polar aligned mount towards a moving object to be a little difficult, but I eventually managed to get the ISS in the camera field of view. Hooray, check out the image below. Is the ISS going through some strange maneuver? No, its just me bumping the mount motion buttons a little bit trying to keep the camera on the ISS. Also, if I had more warning or planning, I would have already pre focused the camera and been ready to track the path all the way across the sky. 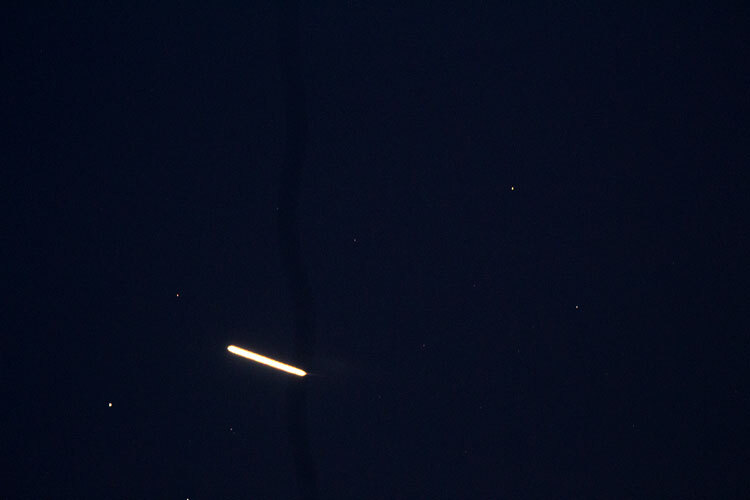 As the ISS moved across the sky, I changed the exposure time to 2 seconds in an attempt to capture that length of track, from start to finish, in one frame so that I might be able to estimate the angular velocity. 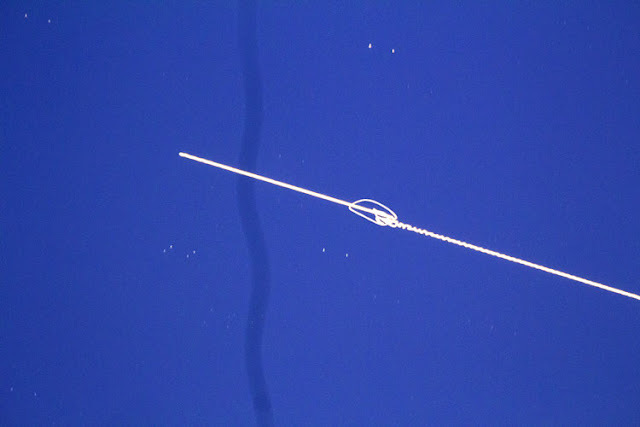 It turns out that even though I caught the ISS motion in one frame there is not enough information available to calculate its orbital velocity from just this one measurement. 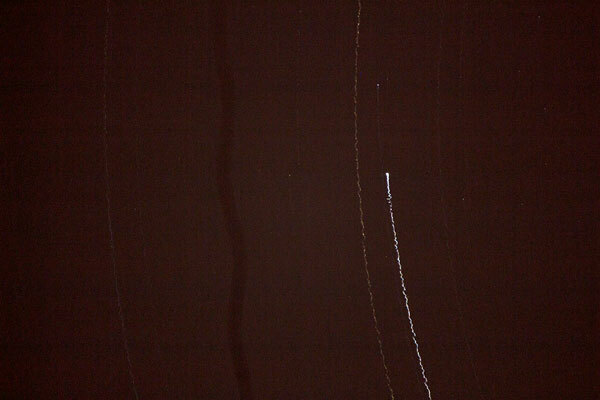 I might have to do some more work in how this might be done by amateur astronomers. The length of the track is 0.55 inches and the plate scale for the image is 0.73 degrees per inch. Anyway thank you Steve for alerting us to this viewing opportunity. By the way if you haven't stopped by the new OCA star party site at Bob Swanson Field, be sure to check it out next time because this new site has much better parking and good paved surfaces to set up scopes on. Thanks for coordinating all of that Steve! Well after all of the ISS excitement, I went back to measure how close the polar alignment was and how much cone error was present with the installed telephoto lens. Recall that in this case with telephoto lens, it is mounted on a v-rail with just one screw, so that it is possible to have some error between the optical axis and the right ascension axis of the mount. So the question is, "How close is my eyeball guess as to making these two axes line up?" To measure the amount of cone error, I positioned the lens so that the image of Polaris was just right of frame center. Then I slewed the mount more than 90 degrees in right ascension while at the same time leaving the camera shutter open. In the image below you can see how Polaris makes a wide swinging arc rather than a circle of about 1/2 degree radius if everything were well aligned. So how much cone error is present? Well, I just used three data points on the arc of Polaris movement and then calculated the best fit radius of a circle matching those three points and the radius turned out to be 17.2 inches and the plate scale is 8.3 inches, which corresponds to 2.4 degrees. I didn't go further and calculate the x and y components of the error, but we can see that there is about 4 degrees of error. It turns out this error didn't seem to create much of a problem in that the alignment procedure seemed to compensate for a big part of it. Also, I don't have a very good way of adjusting the cone error when using the telephoto lens because it is only mounted to the mount with a single /14 - 20 inch bolt. In the previous post of December 7, 2017, we measured the sky brightness here at the observatory and found as our first estimate that it is magnitude 14.3 at that time. Recall that in the earlier post of November 13, 2017, we estimated the surface brightness of the Milky Way to be an average of about magnitude 20. This is why we can't see the Milky Way from here, it is just too dim for the city lights sky background. To follow up on these previous estimates, our observing plan was to perform a sky brightness estimate at the new OCA Bob Swenson Field star party site. The area around the star Aldebaran was selected for the measurement there. Several images of the Aldebaran neighborhood were taken with the 600mm telephoto lens on the tracking mount. 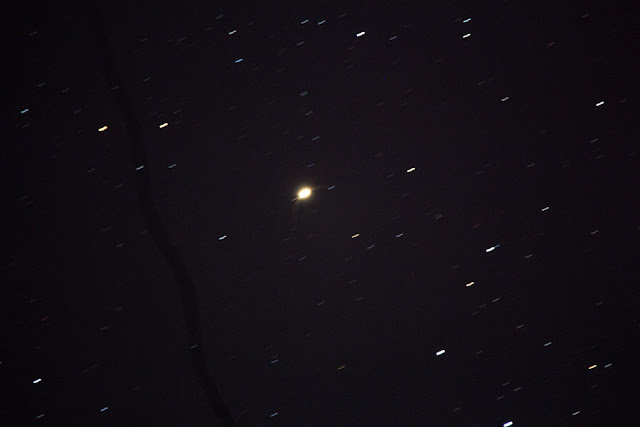 The IMG3410 was taken with 1/60 second exposure and this image was used as the baseline value for the received light from Aldebaran, magnitude 0.9. The maximum PV value for that image was just ( 6024 - 2048 ) = 3976 ADU, so the image had no saturation effects and the sum of light from all the pixels illuminated by Aldebaran was found to be 188,833 ADU (corrected for background and camera bias). 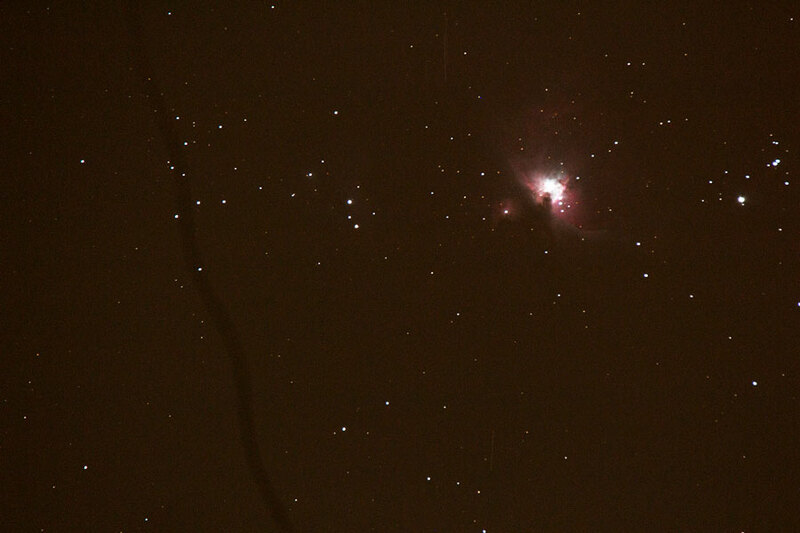 Then IMG 3399, with 121 second exposure, was used to get the baseline value for the average sky brightness. 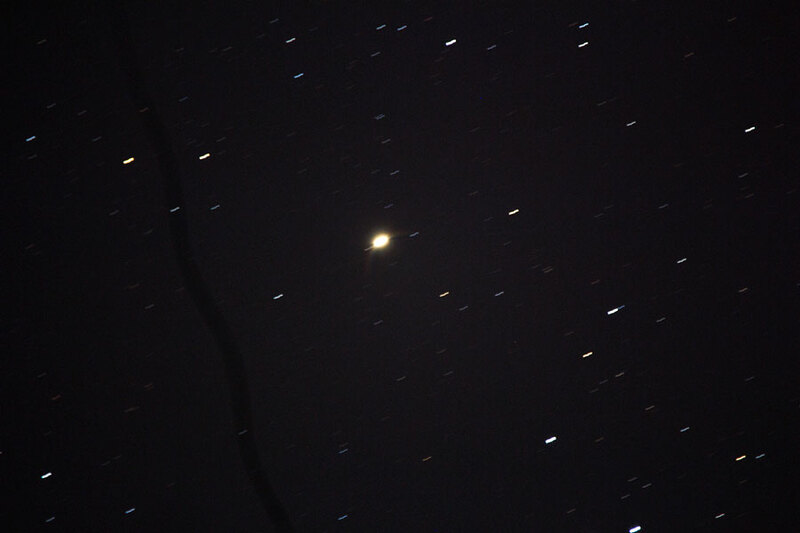 Now using this 121 second exposure image, the AIP4WIN screenshot below shows the arbitrary profile line, just to the right of the saturated image of Aldebaran, over which we are going to average the amount of light from the sky glow. The average value over this profile line was found to be 81.8 ADU (corrected only for DSLR bias and not for atmospheric extinction or lens vignetting). We can now calculate how bright the background sky is compared to the standard star Aldebaran. The magnitude differential is equal to 2.5 * log (188,833 * 60 * 121 ) / 81.8 = 18, so the estimated sky background is 18 + 0.9 = 18.9 magnitude. So we find that the dark sky at Bob Swenson Field is about 4.3 magnitude darker than here in city light views. Keep in mind that this measurement and estimate does not include any of the more detailed correction factors discussed earlier, and which the more professional Astro-photometers do every day, but the value should serve as a guideline of the darker skies. Also this measurement was only made in one direction, toward the East, which was judged to be the more dark direction. A more complete survey of sky brightness could be made taking all directions into account and applying all the correction factors, but this is not needed here. Finally, since Resident Astronomer Peggy's patience with the cold air was running on empty, we decided to pack up everything and call it a night. 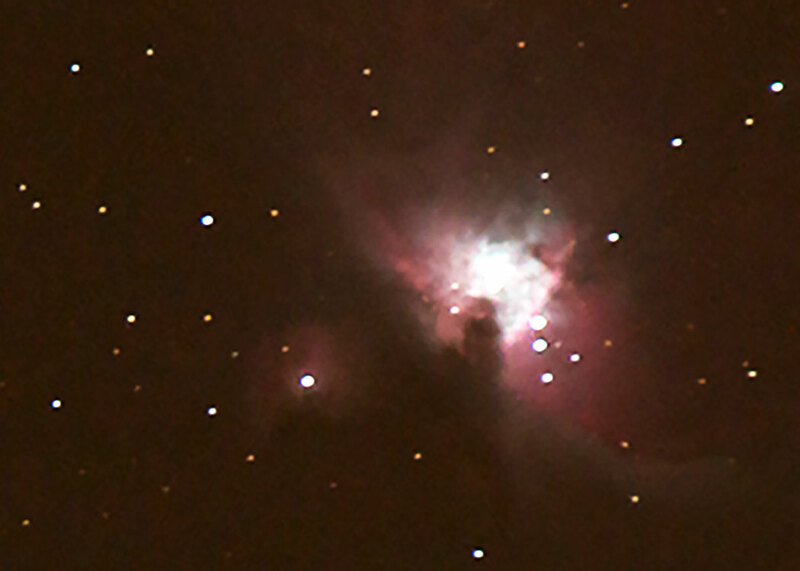 But before turning everything off and since the mount was still aligned and running, I decided to take at least one image of the bright Orion Nebula (M42) and see what it would look like through the 600 mm telephoto lens. The image below was taken with 31 second exposure. The camera field of view is about 1.4 x 2.1 degrees. And just one more expanded view of the Orion Nebula. You can enjoy the place for the country music performers. To enjoy the music with the lyrics is the better thing. You can see the best place for the lyrics. and get the amazing help from the platform of top new releases. A place for the observational cosmologists have fun in the search box. You an find a better way in the milky way. The science is now making a great effort for the people. There is No anchor link for the people and enjoy the dark sky. Fantastic topic of the cosmologists and the fun with science. If you want to know about the science, then the main thing is to do the research. You better that here is the deep relation of science in this informational topic.